"This delicious concoction is the traditional rum punch recipe used in the West Indies, passed down for years. The old rhyme goes, 'One of sour, two of sweet, three of strong, four of weak.' Any fruit juice can be used. Serve chilled over ice, with fruit garnishes and a sprinkling of grated nutmeg." 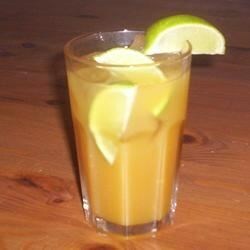 In a pitcher, combine lime juice, simple syrup, rum and orange juice. Add a few dashes of bitters and some grated nutmeg to taste. Serve chilled over ice. "Guaranteed hit at any party!" My only suggestion is to add the simple Syrup "to taste" to avoid over sweetening. I didn't add the simple syrup because I don't like drinks to be too sweet. Also, I couldn't find bitters at the liquor store, so I used Island punch pucker. It was so good!